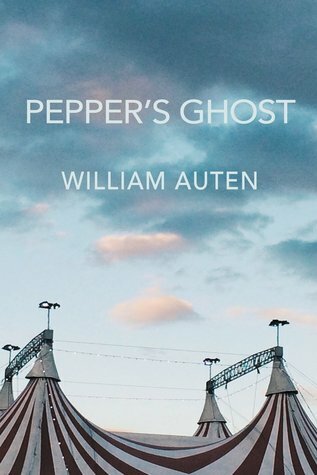 Pepper’s Ghost by William Auten is an ambitious coming of age novel as Charlotte Alexandra Long (“Alex”) struggles through a series of teen tropes but finds some answers in the circus sideshow where tricks serve as truths. This is one of the most difficult sorts of books to review. There’s nothing specific here that one can point to and say, “This is bad” but at the same time, there’s nothing you can point to and say, “This really works.” This is about as average a book as you will find. I never got pulled into the story and Alex remained just a character in a book. Coming-of-age stories are pretty common fare for YA books, but if the central figure is distant or aloof, or otherwise doesn’t capture the reader’s attention, then the book becomes just another story instead of an adventure that you care about. What drew me to the book was the circus theme. It’s a popular theme in books today (it’s hard to find a best-seller shelf that doesn’t have at least one book set in or around a circus) but it’s popular for a reason. Circus are fun and full of promise and mystery and just a little magic. But the inclusion of a circus also means that there’s a bit of a promise from the author to the reader for that magic and I just didn’t feel it. There were little moments that I enjoyed though it ended a little easily and neatly. Looking for a good book? Pepper’s Ghost by William Auten is a tepid, average read. I received a digital copy from the publisher, through Edelweiss, in exchange for an honest review.